Well hello there furpals & humans. Yes we’re back. After a three year break we have decided to restart our blog as we are on a new humongous adventure to the big Smoke of London Town. So we thought we’d write a special new section to our blog which will be turned into a separate book eventually. To get you up to speed on our furry escapades we left our winter mooring at Tamworth on 10 Jan & have been slowly cruising south towards London. This morning we bade farewell to our lovely mooring at Rickmansworth & our nice walkies round the aquadrome. We had our last walk round & mum tried letting us off our leads again. She made the fatal mistake of letting us off together so we bombed off into the distance at the speed of light with the word “biscuits” being yelled behind us by mum. By the time she caught up with us we were playing with a schnauzer called Dexter & Daquiri was proudly running round with a soggy coconut in his mouth that he’d found in the water. At least it was better than what I found a few days back. I was happily munching on some food I found on the floor when all the sudden my mouth set on fire. I had to have a massive drink from the water & all morning I was panting hanging my tongue out glaring at mum for sympathy. She was just mean & laughed & told me it served me right. She says she thinks I ate some chilli sauce. I’m not doing that in a hurry again. 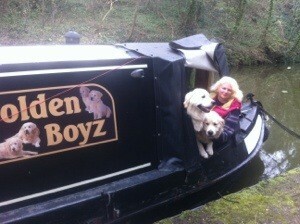 Here’s us back on our leads at Ricky as us boaters call it! After walkies we set off cruising for about 50 metres to one of them big Tesco things. Mum disappeared for a while but then oh joy she returned with 3 massive bags of dog food. The bank there is very high so mum was struggling to lift the bags down but unfortunately she managed it without falling in. Shame that’d be a laugh. Then we set off again. It’s the first hot day of the year so mum took the porthole glass out so it wouldn’t be too hot inside for us. We chilled inside in the breeze while mum did the locks. Eventually after a bit of reversing as it was shallow we stopped at widewater. Wow it’s beautiful here. We went straight out on walkies & got straight into the water to cool down. Mum says we’ll probably stay here tomorrow too as it’s due to be even hotter. Oh happy days. That’s me looking handsome by the water, me in the water & us both with our bottoms in the air when we found something interesting to sniff. Luckily it wasn’t chilli sauce! Love that golden boys are back! Have fun in London, been down there today in Islington (near the cut) going down to that part and near Hackney 4-6 times a year now, are u anywhere near? Thank you. Not yet but we will be. We’re going right throughLondon & up the Lea & Stort so will be going via Hackney. New waters for us.